Ahead of this week’s expected vote in the European Parliament on the document condemning the Hungarian government, commentators are becoming increasingly emotional. The report by Dutch Green MEP Judith Sargentini for LIBE, the Committee on Civil Liberties, Justice and Home Affairs of the European Parliament, could trigger a procedure under Article 7 of the Lisbon Treaty, if approved by two thirds of MEPs. This procedure could eventually result in depriving Hungary of her voting rights within the EU. However, such an outcome would require a unanimous vote within the European Council. 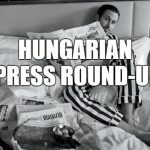 In a four-page essay released through MTI, the official Hungarian news agency, Socialist MEP István Ujhelyi accuses the pro-government press of misrepresenting the report as an attack on Hungary’s anti-immigration stance. He quotes passages from the document to prove that the author and the LIBE commission are concerned about the lack of guarantees of the impartiality of the judiciary and the independence of Hungary’s journalists as well. He argues that the report is meant to protect Hungary’s citizens against government excesses. In Magyar Idők, Dávid Megyeri thinks that ‘Soros’s people’ stand no chance of depriving Hungary of her voting rights, even if a majority of MEPs do vote in favour of their draft resolution. The European Council will never unanimously approve it, he writes. More importantly, the pro-government author continues, many of those MEPs will lose their jobs at next year’s European Elections, as the people of Europe are increasingly dissatisfied with mass immigration. Megyeri thinks that the people behind the Sargentini report have a problem with those European citizens, rather than with the Hungarian government.